Customers can select and schedule appointments from everywhere and around the clock which means that service providers and their employees spend less time on the telephone or answering emails. Online-appointment scheduling can be used for contracting-companies, physicians, consultants and other service providers. The software is also suitable for administrative purposes or as a reservation tool for company conference rooms. Staff members can reserve the facilities conveniently over the intranet. 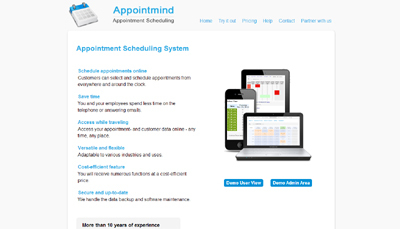 Appointmind also offers their software as white label product for websites that want to offer their customers an appointment scheduling service of their own. We want to bring online appointment scheduling to service directories and web catalogs.